It was a simple campaign clarion call. 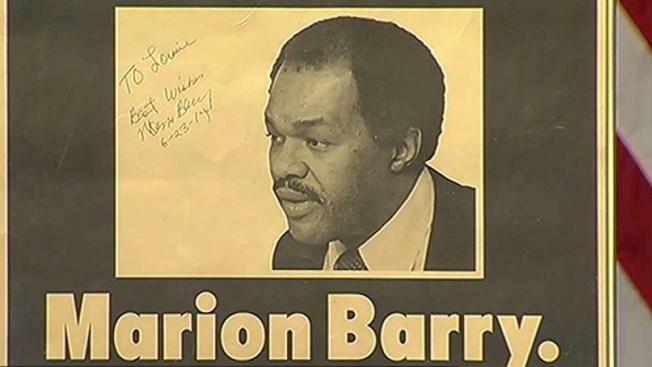 Marion Barry, former street activist, former school board member and D.C. Council member, was running for mayor. And “Take a Stand” posters flooded the District. Barry ran a progressive, upstart campaign against incumbent Mayor Walter Washington and then-Council Chairman Sterling Tucker. Barry tagged Washington and Tucker as old-school. He barely eked a victory in the three-way race, and history was set on a new course. We bring it up now because on Monday, some of the veterans of Barry’s first campaign for mayor in 1978 jointed with George Washington University’s Gelman Library to announce the Barry ’78 oral history project. For the past two years, about three dozen interviews have been conducted with insiders from that campaign. Full disclosure: Your Notebook conducted a couple of those interviews, invited to do so given our long history of chronicling Barry’s career. Private donations of about $6,000 paid for the recording costs and some administrative work by the library. Future histories will be recorded, and organizers hope the project will be widely used online or at the library to tell the history of local home rule and the role 1978 played. Richard Maulsby, a leader of the then-emerging LGBT community in Washington, was one of the first openly gay persons appointed to Barry’s administration. Of the history project, Maulsby said, “It’s not a vanity project; it’s not just about us who worked in ’78.” Maulsby said academics, journalists and ordinary citizens can hear for themselves how the insurgent campaign struggled to pull off the Barry victory. Take a look at library.gwu.edu/ead/ms2342.xml. ■ Pride Week rumblings. Pride Week is a cause for weeklong celebrations and acknowledgement of the LGBTQ community here. Local Washington has long been an integral part of the national movement for lesbian and gay equal rights. History has been made here from simple welcoming neighborhoods and individuals to historic rulings of the U.S. Supreme Court. This group objects to the inclusion of corporate sponsors who the protesters say are using Pride support to bolster corporate image rather than to signal true inclusion. It also objects to allowing D.C. police officers who identify as LGBT to appear in the parade because critics say the police department either still abuses or fails to understand transgender and other social, civil rights issues. “No Justice, No Pride” is sponsoring alternative events this weekend. Whether there is acceptance, approval or objection to its agenda, its involvement and protests illustrate how LGBTQ communities are part of the mainstream of American life. ■ International attention. If you thought Metro gets a lot of local attention for its troubled rail system, you ain’t seen nothing yet. Local media reports over the weekend revealed that an international transit group is planning a conference here in Washington to review ways forward to help Metro. Alain Flausch, secretary general of the International Association of Public Transport, was quoted as saying that for months he’s been in touch with Metro general manager Paul Wiedefeld on planning the conference. ■ Honoring Jim Vance. Your Notebook will be pleased Thursday night to accept an award on behalf of longtime NBC4 anchor Jim Vance. It is the Chairman’s Award from Montgomery Community Media. The award celebrates his more than 45 years as a leading voice in the Washington region. The event is in Silver Spring at the Fillmore. Your Notebook has to wear a tuxedo, but for Vance that’s a piece of cake. He recently announced that he would be taking some time off to deal with cancer, and all of our hearts are with him. ■ A final word. We take a moment to wish the aforementioned Betty King a most happy 85th birthday. We first met her years ago when she was part of Mayor Marion Barry’s first administration. She, among others, was part of a group that helped guide Barry’s successes and tried to steer him from his frailties. She remains an unabashed, active national Democrat and strong believer in our local Washington community. Happy birthday, Betty!